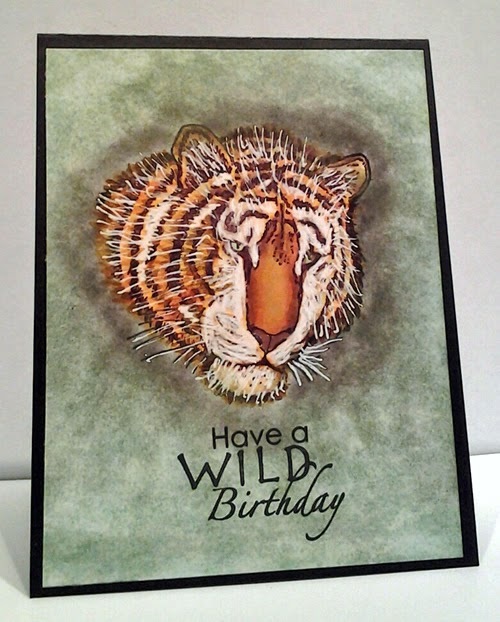 This card was made for "All About The Animals at The Mod Squad Challenge being hosted by Susan Sieracki this week. I colored with Copics. I layered several shades of yellow/orange and added W5 for shadow. The hair was drawn in with a White pen. I used a Soft tool to spread on the Pan Pastel color. I started with black then used a light green topped with a olive green. I love how easy it is to blend with the Pan Pastels. It was then sprayed lightly with a fixative and added to the card base.. The challenge this week at The Mod Squad Challenge Blog is to CASE any one you'd like. filled in below the trees with black Memento marker. The trees on the right extends out to cover a tear my mask made. Be sure to check out the challenge. 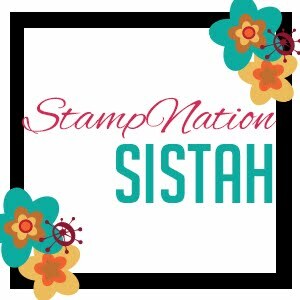 a rubber stamp duo is the prize. 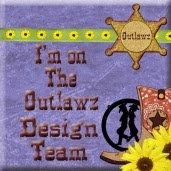 I made this card for the Teal & Purple challenge at The Mod Squad Challenge. I used watercolor paper and Distress inks for the background. The sentiment is heat embossed with black. I distressed the edges (using my /distress-It-All) and layered on Pure Luxury cardstock. 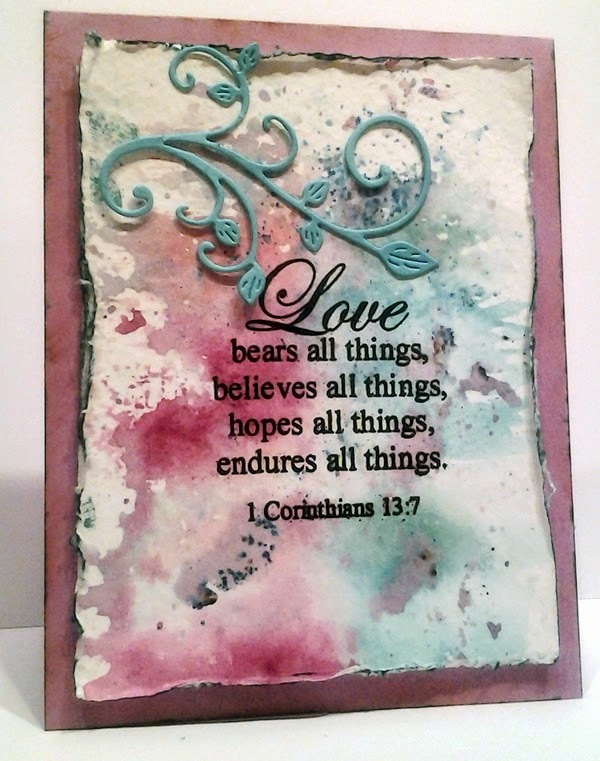 This card is my sample for using teal and purple for the Mod Squad Challenge. 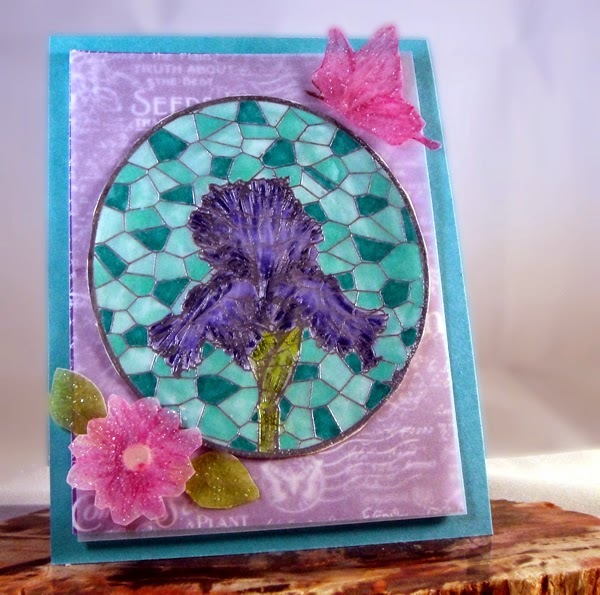 The Iris stamp is from Gina K Stately Flowers 8 by Melanie Muenchinger. I heat embossed the stained glass frame and the Iris. I colored with various shades of teal and purple using Copic markers. The velum flower and butterfly are from GinaK Warm Spring Wishes. The flower and butterfly are head embossed with Judikins glitter on vellum and colored on the backside. The glitter wasn't prominent enough so you could barely see the detail so I colored the back of the vellum. By coloring the back, the glitter now shows. I covered the entire focal image with 3D Crystal laquer. You could also bend to snap the clear coat and make it crackle but that isn't what I wanted. 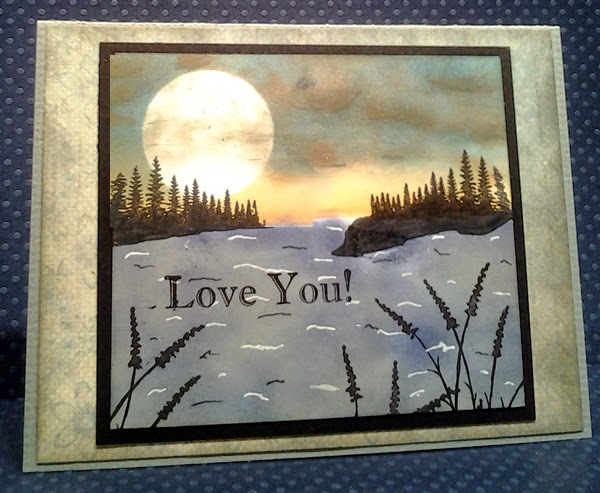 I placed velum over the DP (Graphic 45 Secret Garden) and adhered to Turquoise Sea card base.